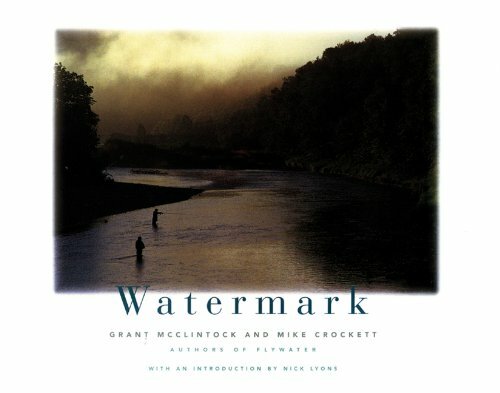 From Georgia to North Carolina, onward to the Catskills and finally concluding at Cape Breton on the Margaree River, photographer/writer Grant McClintock captures the very essence of eastern fly fishing with stunning photographs in his latest book, Watermark. Collaborating with writers Mike Crockhill and Fen Montaigne, McClintock takes the reader along with him in his Airstream hauling Suburban on his fly fishing pilgrimage to the most legendary rivers of Eastern North America. Enroute, the reader will become entranced with the images of natural beauty and will enviously stare at photos of sparkling waters and the fish that live in them. In many ways, through the creative lense of McClintock's camera, the images do provide a fly angler's spiritual journey to the area where fly fishing originated on this continent. Also impressive is the realization that even though modern society has intruded greatly upon wilderness areas in the East, many of our streams and rivers still offer the same angling experiences today as they did a century ago, albeit with not as much solitude. Sharing essay duties, McClintock, Crockett, and Montaigne introduce us to interesting and diverse characters along the way. From the down to earth Georgia guide, the gracious Joan Wulff, to the charming anglers of Cape Breton, Canada, there remains a binding knot - their passion for our sport. While reading, we feel somehow intimately connected with these characters and their lives through our own love of fly fishing. This book is beautiful and is sure to become an enduring classic for anglers - a work that will not sit on the shelf but one that will be opened and re-opened on those occasions when being on the river is not possible.